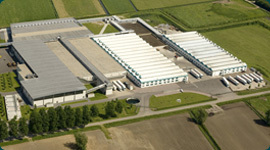 At Hooymans Compost B.V., quality ranks among its top priorities. The result is an attractive, full-bodied mushroom rich in taste. In achieving this result, the process is most important. Free-range chickens deliver a better product because they have more space, and the same goes for compost. We therefore respect time and space. This is taken into account in our plant, which also keeps up with the latest technologies so that we can meet our customers’ requirements. In order to achieve the best quality, it is important to use only the best products which are essential for the composting process. The end product is optimised by means of an excellent selection of raw materials and expert monitoring of the cultivation.